Known for simplistic, tailored and smart elegance, Giorgio Armani was launched in 1975 by Mr Giorgio Armani. Practically inventing red carpet dressing and becoming the first designer to dress Hollywood stars on the big screen, the very powerful Giorgio Armani defined the eighties. The brand was also the first to launch an eyewear collection in the UK. Making a statement for its attention to detail and the use of premium materials, the sunglasses achieve the same recognition as the clothing line. 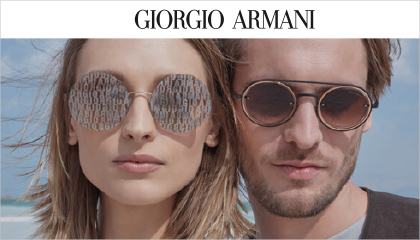 Believing everybody should be able to afford Armani, different collections were created, including frames for life, iconic designs mixed with everyday life.